#Allows to connect RS-485 device to your computer by USB port. #Real USB 2.0 specification compliant for faster and steadier data communication. #TIA/EIA RS-485 standard compliant. #Data transfer rate up to 230kbps. #Transmit distance reach up to 1800m at the rate of 9.6kbps. (The longer distance, the lower rate.) 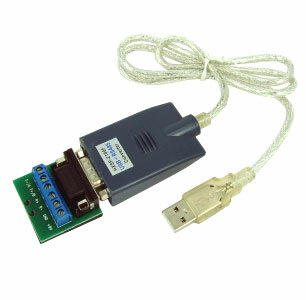 #Supports multiple terminals up to 32 RS-485 devices. #Supports automatic handshake mode. #Supports remote wake up and power management. #Auto sense serial signal rate. Zero delay automatic transmit. #600W surge and 15KV static electricity protection. #Standard USB type A male and RS-485 serial 9 pin male connector with terminal board. #USB bus-powered and no need external power required. #Ideal connections to Modem, PDA, GPS, Bar Code, Digitizer, Digital Camera, Label printer & ISDN terminal adapter, etc. #Supports Windows 98SE, ME, 2000, XP, Vista, Windows 7, Linux v5.0 or above & Mac OS 8.6 or above. #Total length: 80mm.